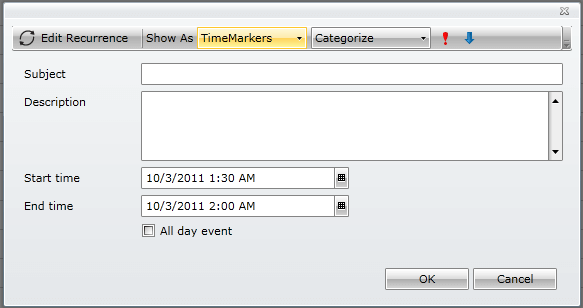 The dialogs in RadScheduleView are displayed in RadWindow instances by default. You can either customize the RadWindow or entirely replace it with any other ContentControl. RadScheduleView uses the IScheduleViewDialogHostFactory and IScheduleViewDialogHost interfaces to abstract the dialog hosts and their generation. The default implementation of the IScheduleViewDialogHostFactory interface that creates RadWindow instances is named ScheduleViewDialogHostFactory. // Set properties on RadWindow here.